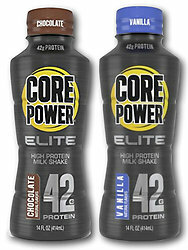 Core Power Elite - Protein Shake. A high protein milk shake made with real milk, simple ingredients and a great taste. Each 14 oz bottle is packed with 42 Grams of Protein and is lactose and gluten free. Two great flavors: Chocolate or Vanilla. A high protein milk shake made with real milk, simple ingredients and a great taste.